The grooming industry is getting a makeover . A few years ago, if a man wanted a haircut, he went to the local barbershop, the kind with posters of film stars with gravity-defying hairdos on the walls. Women who wanted their tresses snipped or eyebrows threaded went to a nearby beauty parlour, usually for 'ladies only' and run by an enterprising neighbourhood woman. But the rise of unisex salon chains is changing all that. A typical example of the new salon client is Aditya Mahajan, a 31-year-old auto industry professional in Mumbai. He switched from traditional barbershops to unisex salons a few years ago. "I wanted a better hairstyle and better service, so I tried one of these salons," he says. He tried out several and eventually settled on the Enrich chain. "Men account for 35 per cent of our footfall and 40 per cent of our revenues," says Vikram Bhatt, Director, Enrich. The Mumbai-based chain expects sales of Rs 55 crore this financial year and plans to take its salon count from 28 to 40 by March. Even established chains are hopping on the unisex bandwagon. Lakme Lever, a unit of Hindustan Unilever, which already has 170 salons across the country, launched its first unisex salon, Lakme Ivana, in July 2011. Clients such as Mahajan are an important factor in the growth of unisex salons. 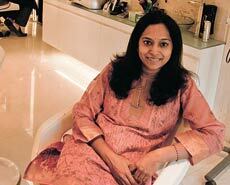 Veena Kumaravel, Chief Executive of Naturals Beauty Salon, says men are increasingly going beyond haircuts. "We see them getting pedicures, manicures and facials, and even getting their hair coloured," she says. A visit to the flagship Jean-Claude Biguine salon at Bandra, Mumbai, corroborates her words. 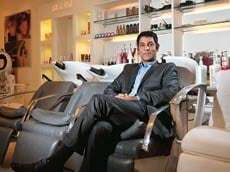 As we talk to Dharmendra Manwani, the dapper Founder and CEO of JCB Salons, the Indian franchisee of the Paris-based chain, a man in his twenties sits with his head under a hair steamer, while a couple more await their turn. A recent report by PricewaterhouseCoopers, or PwC, and the Federation of Indian Chambers of Commerce and Industry pegged the size of the salon business at Rs 7,000 crore. Rashmi Upadhya, Managing Consultant, PwC, says the industry could double in size in three years. "These chains use franchising to scale up and move to Tier-II and Tier-III towns," she says. Jawed Habib Hair and Beauty, for instance, owns only 15 of its 329 outlets in the country. 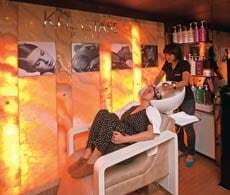 Naturals, which has over 100 outlets, has set up shop in small towns in Tamil Nadu, such as Thanjavur and Chidambaram, through franchisees, and is exploring possibilities further north to nearly double the number of its salons. However, franchising is not everyone's style. Enrich owns and operates all its salons. "Though it may limit our ability to expand, it helps us follow a consistent process and centralise key functions," says Bhatt. While small-town India has huge potential for salon chains, some, such as b:blunt, are sticking to big cities, as going beyond them might mean lowering prices. "We don't want to fiddle with prices too much, because others have got into trouble doing that and trying to be too many things to too many people," says Satyajeet Thakur, Director, b:blunt. The chain has two formats: the flagship b:blunt, where a haircut costs between Rs 850 and Rs 4,000, and b:blunt mini, which charges half as much. Jawed Habib, too, has a compact and cheaper format - JH HairXpreso - for locations such as malls. Besides Indian chains, global ones, such as Toni&Guy and Saks, are making their presence felt. JCB Salons' Manwani says the Indian salon industry is changing rapidly. "Earlier, salons took 12 months to break even. Now it's four months." Each of JCB's five salons makes an average of $1 million (Rs 5.3 crore) a year. While demand is no problem, what could stand in the way of salon chains' expansion is the lack of skilled stylists. To get around it, they have their own academies, whose graduates start with salaries of Rs 10,000 to Rs 20,000 a month, plus commissions and tips. "The growth of the salon chain is impossible without skilled stylists being produced regularly," says Rohit Arora, Executive Director, Jawed Habib. Even companies such as L'Oreal, which supply products to salons, play a role in skill development. "We train 80,000 hairdressers a year," says Dinesh Dayal, Chief Operating Officer, L'Oreal India. "We do not supply some products to salons without first training the staff to use them." Another hurdle salon chains must overcome as they grow is financing. The PwC report notes that funding through internal accruals is not conducive to rapid growth. Jawed Habib filed in February for a Rs 60-crore initial public offering, and is awaiting clearance from the Securities and Exchange Board of India. In late 2010, Enrich raised a reported $10 million from JM Financial India Fund. Analysts say Enrich's peers may also take the private equity route as they grow bigger. Remarkably, the growth of the salon business is something nobody doubts.